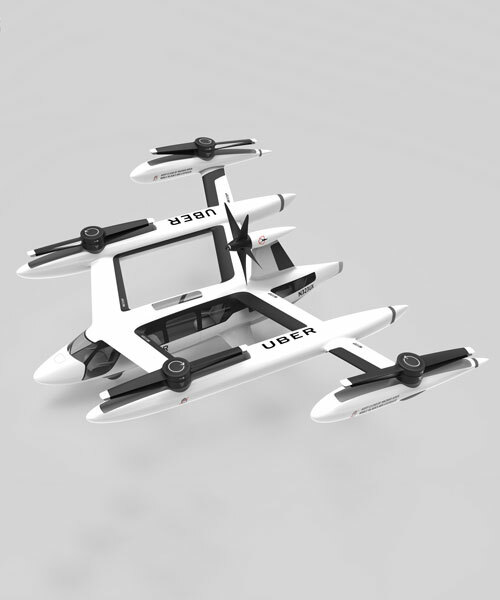 as pointed out by the verge, uber‘s air taxi aircraft is is more like a mashup of a plane and a helicopter rather than a car. four stacked rotors lift the vehicle before stowing away during landing and a fifth rotor on the tail offers forward propulsion. if one rotor fails, the others will continue to operate for a safe landing. the aircraft will be electrically powered, flying at an elevation of 1,000 to 2,000 feet and landing at ‘skyports’ situated on the top of city rooftops. uber hopes to launch the aerial taxi service by 2023. as reported by designboom in january uber will rely on manufacturers such as bell helicopters, as well as embraer and pipistrel, to build their own flying taxi concepts based on the prototype. uber has already signed a space act agreement with NASA to create a brand-new air traffic control system to manage these low-flying car hybrids. they have also announced a partnership with the US army to test the aircrafts. imho this thing is an aerodynamic disaster because the body is largely in the way of the air stream from the rotors. But the general concept is likely to come – hopefully with an intelligent automatic collision avoiding system, but probably with automatic flying in general. This design above seems to need a lot of material to transport 1 or 2 persons?